At Galleria Dental, we pride ourselves on providing high level dental care for both you and your loved ones. From our team of qualified dental professionals, you are sure to be paired with an excellent family dentist near 77046 who can perform a wide range of procedures. 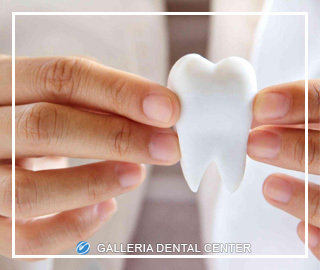 Whether it’s a dental exam or cleaning, a crown or bridge treatment, or an oral and maxillofacial surgery, Galleria Dental is committed to being the family dentist you can trust. We encourage our patients to use their new dental benefits at our office in order to save you and your family both time and money. Contact Galleria Dental today that we can discuss what your policy offers with you. Galleria Dental is first and foremost a customer oriented, family friendly dental office. We believe in offering our patients of all ages a comfortable, relaxed environment that will ease whatever stress they may be feeling about their upcoming visits with their dentist near 77046. Dental Implants: For the loved one who needs to protect or restore his (or her) smile, Galleria Dental has both single tooth and multiple tooth replacements, along with full arch replacements that serve as a fixed bridge between missing teeth. In cases of partially damaged or decaying teeth, we fit patients with porcelain crowns that fit seamlessly over the tooth or dental fillings made of silver, gold, porcelain, or a tooth-colored composite material. Dental Exams and Cleanings: Among a variety of general dentistry procedures, routine checkups and cleanings are essential to good dental hygiene. Exams and cleanings fulfill several key functions: detecting and treating tooth and gum disease; checking for oral cancer and tumors; and for removing tartar and plaque build-up that could cause cavities and gum disease. Root Canal Treatment: When a tooth becomes badly decayed or broken, or when the dental pulp becomes infected, a root canal treatment is needed in order to save and repair it. Endodontic procedures such as root canals are the best means of preventing a painful abscessed tooth that can have serious consequences if it goes untreated. Galleria Dental is open Monday to Friday from 8:30 am to 5:30 pm. Call us at (713)960-9926 to schedule an appointment or use our convenient online form. Let us be the family dentist near 77046 you’ve been looking for!